The surface material of CPU may look smooth, and you may feel that the metal is flat, but in reality, it is never entirely uniform. If you place the heatsink directly on the lid of the CPU, there is no surety that it will stick entirely on the surface without leaving any gaps. The material used in the surface/lid of the CPU and the heat sink are different. Both the material can expand and contract differently in the situation of heating and cooling. Thus, we have to put something to fill the tiny, invisible gaps between the CPU heat-spreader and the heat sink to stop the negative heat transfer. That is why, we need an edge material like thermal paste or CPU thermal pad for better transfer of heat. Both the things have same job role, but they are different from each other. 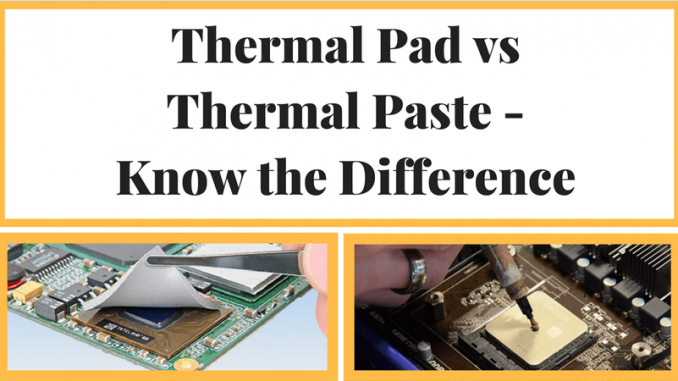 In this article, you will get to know the necessary information about thermal pad vs thermal paste. Thermal paste and the other variants supposed to be an excellent conductor of heat – which is approved by professionals – that’s the whole point of transferring heat from the point A to point B as efficiently as possible. Other Names CPU grease, Thermal compound, Heat paste, Thermal gel, etc. Thermally conductive pad, Thermal interface pad, etc. CPU thermal pad does the same thing, but the essence is not the same. It can be burst after a specific time. Also, such pads are meant more for the RAM modules’ things that get hot but not 100 degrees Celsius hot. Does thermal paste come with CPU? So, as we have discussed, thermal paste or thermal pad is sandwiched between a CPU heat spreader and a large CPU heatsink and helps to bridge the gap between the heat source which is the CPU itself and what is supposed to dissipate the heat – the heatsink. So yes, some CPU does come with the thermal paste already applied on! When you apply the thermal paste, there is an issue with it which is not avoidable. It could be applied more or less. Also, the application of thermal paste can be messier. So, it may not be able to give excellent results. Just because of this ease, thermal pads can be a blessing. But, CPU thermal pad has its own set of problems. It does not last long, and you have to change it often. Apart from that, you can apply thermal paste on a thermal pad, but cannot apply thermal pad on thermal paste. So, most of the professionals prefer and suggest using the paste and not the pad. I hope I have managed to explain what you were looking for! So, from now onwards, whenever you feel any confusion of thermal pad vs thermal paste or want to find out which is the good thermal paste available in the market, don’t think twice before reading this article.